1. Whizz the bread in a mini processor to make crumbs. Warm the butter and oil together in a frying pan over a medium heat. Add the crumbs and fry gently for 3-5 minutes, until golden and starting to crisp. Set aside. 2. 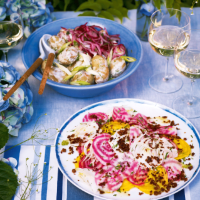 Toss the fennel and beetroot together on a serving plate. In a small bowl, whisk the lemon juice with the sugar. Season, then gradually whisk in the walnut and olive oils. 3. Stir most of the herbs into the dressing just before pouring over the fennel and beetroot. Toss gently then scatter with the rest of the herbs, reserved fennel fronds and the toasted crumbs. This recipe was first published in Thu May 21 13:21:12 BST 2015.